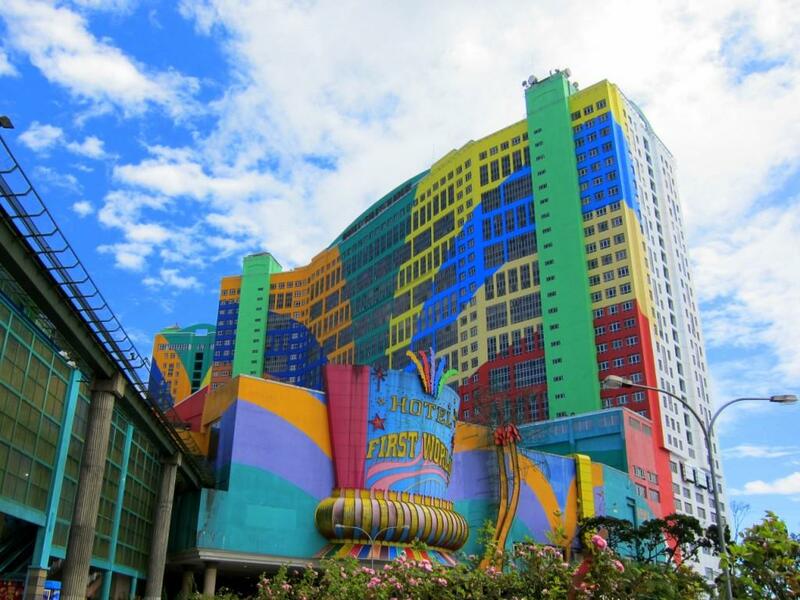 Most Garish Hotel in the World? Maybe, But So What? The reason I can't quite bring myself to hit all the easy targets hanging below the belt is because I have a certain soft spot for this place....I mean, this was my childhood holiday destination every weekend for what seems like years, and I've spent many an afternoon all wrapped up in woolies (the temperature was only in the low 20's but it could have been the Artic as far as my equatorial family was concerned,) paddle-boating in man-made "lakes," and hanging around the video arcade (my first introduction to Pacman and Space Invaders!) while my batik-clad dad and mom headed off to the casino for hours on end, trusting the resort to play babysitter to my brother and me (yeah, our parents were stupendously optimistic about leaving their two giddy children, both under 10 years old, to their own devices, armed with just 10 ringgit (about US$3.16) in coins - for the arcade, you see - in one of the largest playgrounds in the world.) We loved every minute of it. I never had the privilege of staying at this particular colourful hotel - it didn't even exist back in my day; we were always ensconsed in its slightly statelier grand auntie, the Highlands Hotel - but I've no doubt my brother and I would have been delirious over the 500,000 square feet of FUN-O-RAMA (my words, not theirs) that is the First World Plaza, complete with (deep breath now) shopping malls, arcades, food outlets, Starworld Casino, the Genting Indoor Theme Park, a mini stage for weekly "live" magic and music performances, a replica of the Statue of Liberty and an Oscar statue, the Watersplash Pool (an indoor water theme park for children), Genting Sky Venture (Asia's first free fall simulator) and a cineplex. We'd have loved every minute of it too.